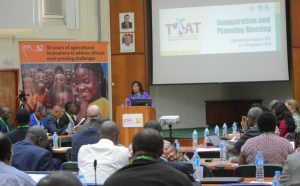 IITA hosted scientists, technologists, economists, development partners, and program specialists from partner organizations to inaugurate Technologies for African Agricultural Transformation (TAAT), in Ibadan on 22–24 January. TAAT, a multi-year, multi-partner program, was conceptualized based on “Africa Feeding Africa” as a pillar of the Feed Africa Initiative of the African Development Bank (AfDB). It aims to bring agro-technologies to scale among farmers in Africa. Chianu also noted that low agricultural productivity and value addition are at the heart of the malnutrition, unemployment, and income challenges in Africa. These have ensured that African agriculture has continued to underperform as it accounts for 60–70% of employment in African countries but produces only 25% of Africa’s GDP. The TAAT program has been put together to change this narrative. One of the many opportunities in TAAT is the building of strategic alliances among key development partners such as AfDB, World Bank, AGRA, Gates Foundation, Rockefeller Foundation, International Fund for Agricultural Development (IFAD), Food and Agriculture Organization (FAO), US Agency for International Development (USAID), Department for International Development (DFID), and French Development Agency (AFD). This collaboration will lead to advancement of agricultural development in Africa working with international, regional, subregional, and national centers of excellence (including CGIAR centers) and the private sector. TAAT is not a research program; it was formulated solely for the dissemination of proven technologies that have already been developed by the agricultural research and development system. TAAT will add extra value by leveraging crop and livestock technologies that have been validated in one or a few countries across entire agroecological zones (AEZs) covering many countries. The TAAT program is expected to result in a Regional Technology Delivery Infrastructure (RTDI) with an emphasis on AEZs and priority commodities that will reach 40–50% of African farmers with the most relevant food production technologies by 2025. TAAT also aims to tackle pests and diseases, such as Fall Armyworm (FAW), across entire regions.